Putting a 707-horsepower engine in a steet-legal car is crazy enough. Now Fiat Chrysler Automobiles has gone off-the-charts insane by cramming the supercharged Hellcat V8 under the hood of a Jeep Grand Cherokee, creating one of the strangest and most exciting Frankenstein SUVs the world has ever seen. It’s called the Trackhawk, and it’s hard to believe a vehicle like this even exists. It does, though, and I just spent a week driving one in its powerful, wonderful, illogical glory. Track-capable Grand Cherokees are nothing new, as Jeep has been thrilling enthusiasts with fast, surprisingly nimble versions under the SRT badge for years, carving out a microscopic niche within the already tiny world of high-performance SUVs. But the 707-horsepower Trackhawk takes things to a completely different level, starting by making its mind-blowing power actually usable. I’ve driven the Hellcat-powered Charger sedan and Challenger coupe from Dodge, and they’re basically 707-horsepower monuments to tire smoke. That’s fun, sure, but it takes a skillful touch — something I don’t have — to get all that power to the pavement without vaporizing the back tires on those rear-wheel-drive monsters. It’s difficult to get full use out of all the power, ample as it may be. The Trackhawk, on the other hand, makes it easy. 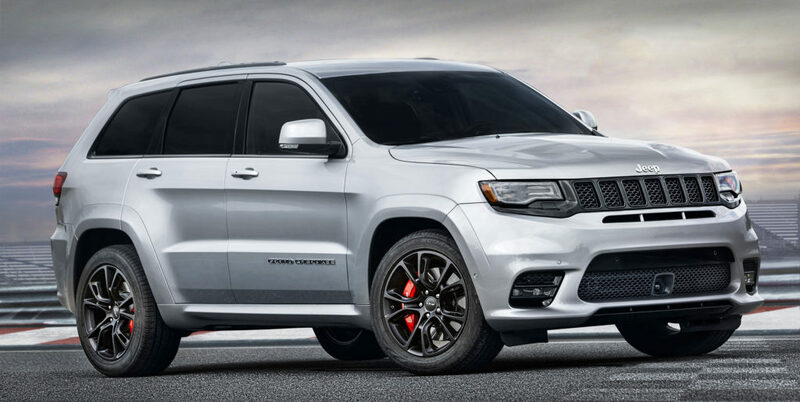 Jeep claims its new Grand Cherokee Trackhawk is the fastest SUV in the world, accelerating from 0-60 mph in 3.5 seconds en route to a top speed of 180. Stomp on the gas pedal, and the all-wheel-drive system spreads the astronomical torque between four tires, helping it comfortably stick to the road with nary a tire chirp while it rockets forward with unimaginable force. It goes from 0-60 mph in a supercar-like 3.5 seconds, Jeep claims, all while blasting a throaty death shriek from under the hood that makes you want to summon an exorcist. Seriously, hearing a Hellcat V8 at full throttle is a spiritual experience. Like a Ferrari V12, it’s an unforgettable sound that leaves a mark on your heart for life. Assuming you keep a delicate touch on the throttle, the Grand Cherokee Trackhawk is impressively easy to drive around town. It’s quiet, spacious and smooth riding, with a reasonably demure personality that helped me pick up kids from school and get groceries without drawing much attention to the wild, rare and ridiculously overpowered vehicle I was driving. Enthusiasts, though, will notice the styling and functional changes that set the Trackhawk apart. “Supercharged” badges on the side and a sculpted hood with two heat extractors make it clear that this Grand Cherokee is very different from the rest, all without resorting to juvenile wings and garish paint schemes. On the inside, the Trackhawk is impressively spacious and luxurious, as it should be with a starting price of $85,900. It’s classy — at least as classy as a pricey, overpowered, track-day toy SUV can be. It should go without saying that buying a vehicle like this makes little logical sense. Its fuel economy ratings (11 city, 17 highway, 13 combined) and price tag ($85,900 to start, or a hair under $100,000 with options on my tester) make it something that attracts only the most wildly enthusiastic buyers, not your average mom or pop who walk into a Jeep dealer. It’s also so fast, with a top speed of 180 mph, that the limits of its performance can’t even remotely be explored safely on public roads. Fortunately for those adrenaline junkies who want a lightning-quick, 707-horse vehicle that can go straight from the racetrack to the trails, Jeep was crazy enough to make this thing. Thank goodness. It’s a four-wheel-drive Jeep that accelerates like a supercar and still lets you do some off-roading. It’s 707-horsepower insanity, in a good way.